MORI SEIKI MR-1500 ENGINE LATHE, W/ 4 JAW & 3 JAW CHUCK, DIAL INDICATORS. MORI SEKI MS-850 ENGINE LATHE, WITH 3 JAW CHUCK, 5C COLLET CLOSURE. OKUMA MODEL LT GA ENGINE LATHE, 24’’ X 120’’, 4 JAW CHUC, FACE PLATE, TRACER. HERBERT NO 9C-30 TURRET LATHE, 25’’ 4 JAW CHUCK, 7 TO 600 RPM. OKUMA LC40 4 AXIS SIMULTURN CNC LATHE, 2 TURRETS, 12 STATION & 8 STATION TURRETS, TAIL STOCK, OSP 5000L CONTROL. 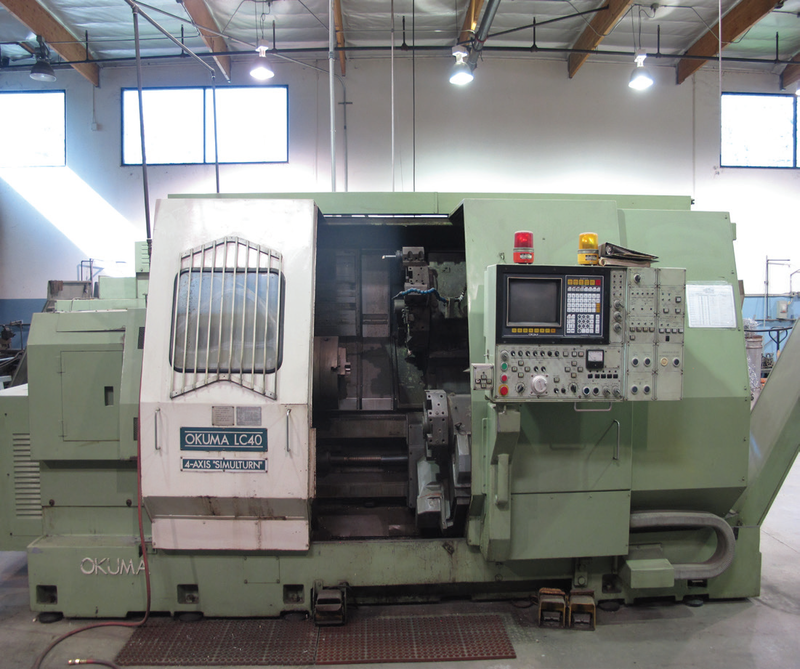 1987 OOYA RE-1MV CNC VMC, CAT 50 TAPER, 36 ATC, FANUC 11M CONTROL, S/N 663009. TONG IL CNC VMC, MODEL TNV-80, BT 40 TOOL, 30 ATC, 4 TH AXIS ROTARY. 1990 MITSUBISHI DWC 110C CNC WIRE EDM S/N 5910219 (NEEDS PARAMETERS) BRIDGEPORT VERTICAL MILLING MACHINE, 2HP VAR SPEED, POWER FEED, DRO, CHROMEWAYS, S/N 248735. PRECISION TOOLING, KDK SETS, COLLETS, VISES, CT HOLDERS, BT40 HOLDERS, INDEXERS, SUPPORT TOOLING. BT40 90 DEGREE ANGLE HEAD. LARGE SELECTION OF INSPECTION TOOLS, MICS, CALLIPERS, HEIGHT GAGES AND ETC. SUFACE PLATE 4FT X 8FT X 10’’.